Someone emailed me to ask what's the difference between the Exploded-View Part Diagrams in Original Factory Parts Books as compared to the Part Diagrams in the PET Parts Book CD. I didn't know, off hand, so I decided to compare them. What I found out surprised me, and you can see the differences yourself in the images below. The differences are striking. The Factory Parts Books have part diagrams that are larger and clearer and the diagrams take up the whole page. The PET CD has part diagrams that are only a half a page in size and are not as clear and as detailed. If you look closely, they are essentially the same line drawings, sometimes arranged differently, but the size and the clarity of the Factory Parts Book diagrams are much better! What has happened is that the part diagram drawings in the PET CD have been reduced in size by half, and some of the part numbers are on the other half of the page. The rest of the part numbers are on separate pages, as are all part numbers on separate pages in the Factory Parts Books. Take a close look at the images below.................and YOU CHOOSE! Group I, Page 1, Engine Case, 356-A Factory Parts Book. Illustration 101-10, Page 001, Engine Case, PET. 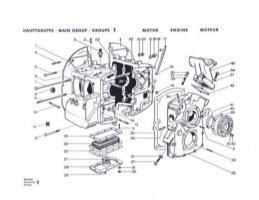 Group I, Page 5, Engine Tin, 356-A Factory Parts Book. Illustration 105-00, Page 001, Engine Tin, PET. Group 3, Page 33, Pedals, 356-A Factory Parts Book. Illustration 702-05, Page 001, Pedals, PET. Group 6, Page 49, Body, 356-A Factory Parts Book. Illustration 801-05, Page 001, Body, PET. If you need just the part diagram sets, I can provide them! If you need complete parts books, I can provide them too! But I don't provide the PET CD! (1) 356-Pre-A (1950 to 1955), 51 pages, covering Coupes & Cabriolets in a 3-ring binder. $18.00. (2) 356-A (1956 to 1959), 74 pages, covering Coupes, Cabriolets & Speedsters, in a 3-ring binder. $19.00. (4)**356-B T-6 (1962 to 1963), 46 pages, (Supplement to 356-B T-5 set) for Coupes & Cabriolets, in a 3-ring binder. Note: you need item #3 above for a complete reference. $18.00. (5)**356-C (1964 to 1965), 42 pages, (Supplement to 356-B T-5 set) for Coupes & Cabriolets, in a 3-ring binder. Note: you need item #3 above for a complete reference. $18.00. (6) COMPLETE SET, Items 1-5 Above, all years/models (1950-1965), in one binder, 285+ pages - $65.00. (7) **Items 3 & 4 above or 3 & 5 above, together in one binder - $29.00. with complete information and an Order Form! 150+ color photos with detailed step by step rebluild instructions!